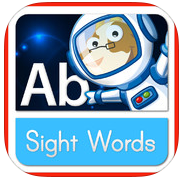 Sight Words Space is a (free today) iPad app designed for KDG/1st graders learning how to read and working on Science vocabulary words. The app is an interactive workbook that has students tracing words, listening to words, and playing fun interactive activities to help reinforce reading and word recognition. Also, students will be learning about Space, counting stars, and more. I highly recommend checking out Sight Words Space by clicking here!!! For more info on Sight Words Space check out EDshelf. For my Pinterest board on Educational Apps click here.